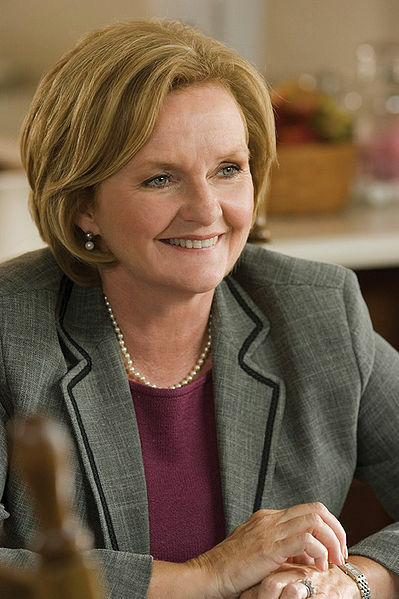 Claire McCaskill and the President's Jobs Bill: Naming names? There are some senators who are up for election who say I’m never gonna vote for a tax increase while I’m up for election, even on the wealthiest people. So, we’re not gonna have 100% Democratic senators. That’s why it needs to be bi-partisan and I hope we can find some Republicans who will join us to make it happen. We pretty much know who he’s talking about here: Mary Landrieu, Ben Nelson, and Claire McCaskill. Maybe Bill Nelson, maybe even Jon Tester, as well. Get that? Is our Claire McCaskill really one of the votes standing in the way of policies that we elected her to support? Given the content of her recent email, touting an op-ed she wrote for the Kansas City Star, I’d say it’s hard to tell just where she plans on coming down; it seems to be a little of this and a little of that, amounting to not too much of anything. I include the introductory content of her email – minus the op-ed she also includes – below the fold. (The op-ed can be found here.) You will notice, if you read both, that she’s carefully trying to work both sides of the street, shoveling on the GOP’s favored anti-government, anti-regulation, anti-tax rhetoric, while mentioning some of the jobs bill provisions and other initiatives that liberals can be expected to approve. During this debate, Missourians have heard from politicians on the extreme ends of the spectrum – some shouting that the government can’t do anything and folks should be left on their own, and others shouting that government is the solution and that we can spend our way into a full-blown recovery. The solutions she explicitly endorses are okay, mostly, if underwhelming. Lots are typical McCaskill, which is to say lots of itty-bitty pecking-at-the-details types of legislation, which, while undeniably useful, are apt to have correspondingly small effects, at least when taken individually in the way she seems to be promoting. She mentions such efforts as consolidating job training programs, combating tariff evasion, etc. She indicates that she will support transportation infrastructure spending, although she does not indicate the extent of her support of the relevant proposals in the President’s jobs bill, nor does she mention support for education infrastructure spending or other important provisions that the President has proposed. In short, McCasikill has produced a genuinely artful exercise in trying not to piss anyone off too terribly much. And we all know the problem with this type of approach, right? How about instead of protecting these senators, leadership leans on them a little harder to get on board with what is probably the key push to save all their hides, including President Obama’s, in 2012: jobs. A little bit of populism, a little bit of taxing the rich, in Nebraska, in Missouri, in Montana, even in Florida, isn’t going to hurt any senator seeking reelection. Not in those states. Of course, there’s always the possibility that some of these senators are more concerned with their big money supporters than the voters. I personally wouldn’t accuse McCaskill of anything more venal that worrying about the much vaunted outstate conservatism. I will, however, hold her accountable for enabling a destructive GOP narrative when she doesn’t really have to do so. As to what she’s going to do about the jobs bill when push comes to shove, who knows? And aren’t we entitled to know? We pay her salary after all. Same goes for asking whom she expects to please with efforts of this sort. Or, put another way, just whom is she trying to fool? I spent the month of August criss-crossing Missouri to hear directly from Missouri businesses and workers. They all told me the same thing, that they want to see Washington stop playing politics and get to work on commonsense measures that can get bipartisan agreement. They don’t want any more big promises. They want to see those hard-working Missourians struggling in this economy get back on their feet and back to work without losing their homes or ability to feed their family in the process. They want an economy that is not overburdened by unreasonable or untimely regulation. They want Washington to listen and to focus on helping in ways that actually work. Based on what I learned in August, I have introduced bills to crack down on unfair trade practices, and ensure that contracts reserved for small business actually go to small business, and I am working on legislation to consolidate job training programs so that less money gets wasted on administration and more money gets to the businesses and workers who use it. I am fighting to win a long term extension of transportation funding so we can fix our nation’s crumbling roads and bridges and put thousands of Americans to work in construction. And I am prepared to work on provisions in the President’s jobs proposal, like tax relief for middle income earners and tax incentives for businesses hiring new employees, that have traditionally won bipartisan support. With this in mind, and knowing of your interest in the state of our economy, I have included the op-ed I recently published in the Kansas City Star about my trip, which you can read below. The White House started an online petition process on September 22nd, with an initial staff review threshold of five thousand signatures for petitions submitted through the process. Restore democracy by ending corporate personhood. Citizens United dramatically altered the political dynamic of our country. Never before have corporations had so much sway over our country’s politics, and as a result our nation looks less and less like a democracy every day. By calling corporations “people” and deeming money to be “free speech,” we are allowing the richest Americans to influence politics in a way that the vast majority of us can never dream of. By ending corporate personhood we can restore our country’s democratic vision and create an America that answers to people rather than to money. Stop the top 1% of Americans from drowning out the voices of the 99%. End corporate personhood and stop giving an unfair advantage to the wealthy few before it’s too late. Evolution has been unquestionably supported by scientific evidence, and is universally accepted in the scientific community, While it may run contrary to personally held religious beliefs, it is not the purpose of our publicly funded education system to teach religious dogma as fact, or even controversy, in a biology class. It makes as much sense to teach creationism in a science class as it would to teach that the sun rotates around the earth in an astronomy class, or that lightning and storms are created by the the gods in a weather science lecture. Evolutionary theory is the basis for much of modern biology, and to accept creationism is to reject modern knowledge of geology, carbon dating, genetics, and history. Depriving or confusing students about Evolution is unacceptable. There’s probably a less dramatic way to demonstrate natural selection to school children. At this point no republican has announced as a candidate. But, no one should get comfortable. Given their history republicans have no shortage of high dollar contributors willing to prop up their candidates. Would you run that by me again? I had to watch the video a few times. Then I checked the basics…pulse, respiration, shadow…all signs indicated that I was , indeed, still an occupant of our mortal coil, so I watched it one more time. Yes, Wayne LaPierre really did say, with a straight face and in public, that the evidence that President Obama wants to come after my guns is…wait for it…the fact that he hasn’t come after my guns. Seriously. LaPIERRE: [I]n public, [President Obama will] remind us that he’s put off calls from his party to renew the old Clinton [assault weapons] gun ban, he hasn’t pushed for new gun control laws, and he’ll even say he looked the other way when Congress passed a couple of minor pro-gun bills by huge majorities. The president will offer the Second Amendment lip service and hit the campaign trail saying he’s actually been good for the Second Amendment. But it’s a big fat stinking lie, just like all the other lies that have come out of this corrupt administration. It’s all part — it’s all part of a massive Obama conspiracy to deceive voters and hide his true intentions to destroy the Second Amendment in our country. Any bets that all the republican members in the General Assembly run for reelection on jobs? Yeah, chutzpah. The White House started an online petition process on September 22nd, with an initial staff review threshold of five thousand signatures for petitions submitted through the process. Several petitions have quickly reached that threshold. As of this writing there are 89 petitions on the site. Is this a great country, or what? Concerned citizens have been trying to meet with Rep. Todd Akin for weeks to discuss his radical votes and statements attacking Medicare, Social Security and Medicare. Voted to end Medicare as we know it, which would force seniors to pay 6,400 dollars more out of pocket every year and buy insurance directly from the insurance companies. Wants the federal government to “get out of the business” of Medicare, Medicaid, education, protecting our air and water, food stamps… and more…. As if anyone should be afraid of their constituents? It must depend on the election cycle and which political party you belong to. Well, you can certainly ask Representative Akin (r) using the Twitter hashtag #AskToddAkin. So, does this mean Representative Vicky Hartzler (r) wants to crack down on guns getting to Mexico? ….The Mexican authorities say they seized 20,000 weapons from drug gangs in 2008, the majority bought in the United States. The authorities in the United States say they do not know how many firearms are transported across the border each year, in part because the federal government does not track gun sales and traces only weapons used in crimes. But ATF officials estimate that 90 percent of the weapons recovered in Mexico came from dealers north of the border. In 2007, the firearms agency traced 2,400 weapons seized in Mexico back to dealers in the United States, and 1,800 of those came from dealers operating in the four states along the border, with Texas first, followed by California, Arizona and New Mexico…. ….As an unprecedented number of American guns flows to the murderous drug cartels across the border, the identities of U.S. dealers that sell guns seized at Mexican crime scenes remain confidential under a law passed by Congress in 2003…. Interesting. Does anyone think Representative Hartzler (r) will sponsor legislation to reveal that information to the public? Probably not. No limits. That’s sorta the point for them, isn’t it? Which Missourians for Responsible Goverment? Alas, there has been some confusion about who we are. The Missouri Record is published by Missourians for Responsible Government, a 501(c)4 non-profit registered with the Missouri Secretary of State as MFRG, Inc.
We are NOT the Missourians for Responsible Government PAC directed by Gary Markenson of the Missouri Municipal League that apparently operates as a shill for developers and energy companies. That is a good question. Which one? It is a commonplace among progressives that many GOP politicians serve the interests of a wealthy minority, and do so by exploiting the not necessarily wealthy, low information segment of the population. The right’s almost religious opposition to the Affordable Care Act (ACA) provides an interesting case study that seems to illustrate the truth of this contention. To start with, consider the release today of the annual survey prepared by the Kaiser Family Foundation and Health Research & Education Trust. One finding is that by 2021, if the current cost trajectory continues, employee-based health insurance premiums will increase from an average of $15,073 today to $32,175, more than doubling over 10 years. Those poor souls who must enter the insurance market on their own, without the benefit of an employer’s benefit plan, will pay even more. Then take into consideration that, according to the latest census data, the ranks of the uninsured in Missouri amounted to 14% of the population, or 826,600 individuals at the beginning of 2009. Since we’re dealing with a deteriorating employment picture that may not improve any time soon, those numbers are undoubtedly higher now and will continue to increase. Not a pretty picture- at least not until 2014 when, under the Affordable Care Act (ACA), insurance exchanges should become operational. You remember insurances exchanges don’t you? Each state is required to set up an exchange that would give individuals and small businesses a unified place to shop for affordable and, for the neediest, subsidized health insurance plans. Exchanges can be developed by states in order to take into account local conditions, although if states fail to act, the federal government will step in and implement an exchange. Anther good thing about exchanges: They prohibit insurance company price-gouging. For instance, insurance plans in the exchanges have to demonstrate that 80% of the premiums they receive are used to pay for health care, and participating plans would have to provide stringent justification before increasing prices. Doesn’t sound too bad, does it? Makes insurance affordable for those in the market all by their lonesome, while holding health care costs down for all of us. Got all this down? Good. Then watch this video of state Senator Jane Cunningham going ballistic. She snorts, bellows, and paws well-trampled Tea-Party constitutional ground, charging the governor with violations of the same because he seems to have taken it for granted that it would be in the interests of citizens of the state to accept a federal grant to help establish the exchanges. Bear in mind, we’re talking about our tax dollars coming back to Missouri. And of course, in spite of her histrionics, Senator Cunningham is dead wrong when she suggests a lapse of propriety on the Governor’s part. — Anti-ACA crusader Jane Cunningham filibustered the House Bill in the Senate. — Prominent among the Committee members – six Republican Senators and two Democrats – is the bellowing diva above, Jane Cunningham, who, along with a majority of the GOP members of the Committee, have long been on the record as virulently opposed to any government role in health care delivery. — To all appearances, Senator Cunningham and her fellow-travelers on the Committee are attempting to use the hearings to sabotage the establishment of a Missouri Insurance exchange. Scores of witnesses who wish to speak in favor of an exchange have not been allowed to testify in hearings where insurance industry spokespeople and others opposed to the exchanges dominate. … they don’t care very much about the ACA. They strongly oppose the health care plan that Barack Obama and Nancy Peloci and Harry Reid crammed through Congress against the will of the American people, and they think it’s an unconstitutional power grab that amounts to a government takeover that’s going to bankrupt the nation by cutting Medicare and death panels and all. But they don’t know or care anything about the exchanges, or the cost-cutting efforts, or most of the rest of it.